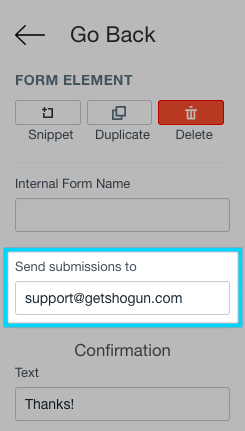 The form element can be used to collect form responses and email addresses from visitors to your Shogun pages. Forms are great for receiving messages from and collecting emails from your customers and visitors. Form Elements will use your theme's styling by default. To get started with the Form Element, simply drag a Form Element onto your page. Adding a new form field to the Form Element is easy! Simply click the 'add new field' button in the right-hand menu of the editor to get started. 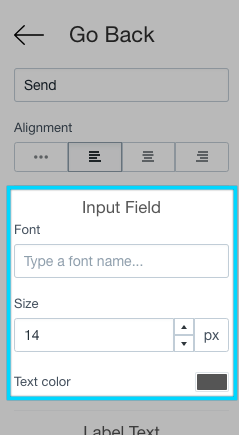 When adding a new field, you will notice that there are different options to customize this new field. 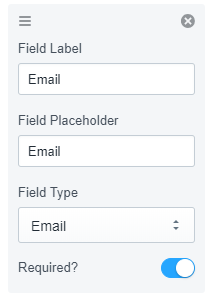 Field Label allows you to customize the title of the field, and Field Placeholder allows you to inform the user of what input is to be expected within the field. Field Type allows you to set which type of input is allowed in the field. Required? determines if the user can submit the form without filling in the field or not. Toggle this on a field of important information to ensure that your user does not submit the form without it. Form submissions will be emailed to the email that is provided into the Form Element. We would recommend changing this first to ensure that they are being sent to the correct place. Form submissions are also stored in your Shogun dashboard in the 'Form Data' section. You can download these as a CSV file which can be opened in many applications, such as Microsoft Excel. The confirmation message is displayed to your visitor once they have submitted the form. You can customize this to change the message that is displayed to the user, and how it is displayed. The Text field allows you to change the message that you send to your user once they have submitted the form. The Background Color allows you to change the color of the background of the message, whereas the Text Color option allows you to change the text color. 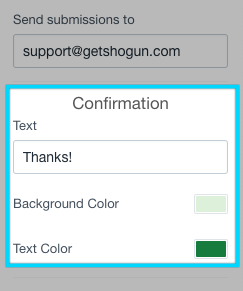 The submit button on your Shogun Form Element can also be customized to fit your needs. 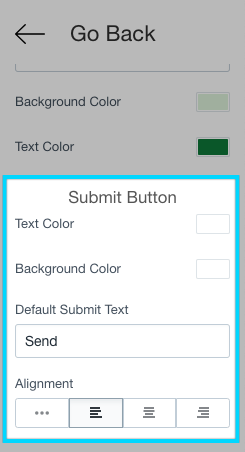 The Text Color option allows you to change the color of the text inside the submit button, while the Background Color option allows you to change the background color of the button. You can change the Default Submit Text to better reflect what action the user is performing. Alignment allows you to change the alignment of the button, from the right, left, or middle. You can change the font of your input fields using the Google Fonts API. Simply start searching for a font in the Font field. You can also change the Size of the font and the Text Color. Just like the Input Fields, the Label Text can also be customized to better suit your needs. 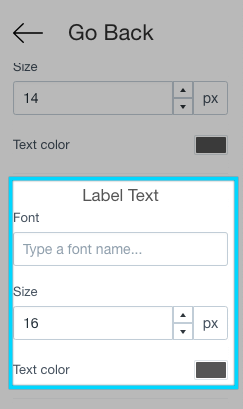 This field also uses the Google Fonts API to allow you to select a font to use.